Mickey Moniak has entered his first Spring Training as a pro ready for the rigors of a baseball season: he's bulked up 20 pounds since he was drafted with the No.1 overall pick nine months ago. CLEARWATER, Fla. – The fraternity of former No.1 overall picks doesn’t interest Mickey Moniak. He hasn’t heard from Pat Burrell or Delmon Young. Fellow San Diego-area natives Matt Bush and Stephen Strasburg didn’t make any house calls this winter. There have been plenty of success stories (Ken Griffey Jr., Chipper Jones, David Price) but there have also been more than a couple former No.1 picks that went bust, too (Bryan Bullington, Tim Beckham, Brien Taylor). Moniak instead chooses to follow the lead of the people he knows, players who have had almost immediate success within the Phillies family. The 18-year-old is friends with J.P. Crawford, the top prospect in the organization for the last three years. Crawford reported to his second major league camp just a month after his 22nd birthday. “He was a guy who rose fast … so anything I can learn from him (is great),” Moniak said. Moniak and Crawford share an agent and live about 75 miles apart in Southern California. They met halfway for regular hitting sessions this winter. This time a year ago Moniak was a senior at La Costa Canyon High School in Carlsbad, Calif. He was ready for the next chapter of his life and the upcoming June major league draft, but he wasn’t sure exactly where he was headed, obviously hopeful the first-round projection would hold up. And then came draft night. And then a move across the country a little more than a month after his 18th birthday. As an elite prep player, Moniak has done a good bit of traveling as a teenager (playing in tournaments in Florida, Colombia, Japan). So he didn’t come down with a case homesickness during his first extended period away from friends and family. Still, becoming a pro athlete at such an early age is a lifestyle change. The budding outfield prospect laughed. He’s been able to lean on the likes of Crawford to learn what to do and what not to do, to learn how to handle himself as he takes the baby steps in A-ball that should eventually lead to his own locker space in the big league clubhouse in a Spring Training in the near future. After an impressive run in the Gulf Coast League last summer – hitting .284 with a .340 OBP, a home run, 11 doubles, four triples and 10 stolen bases in 46 games – the next step in Moniak’s progression will likely come at Low-A Lakewood, where Crawford himself played as an 18-year-old four summers ago. Mickey Moniak hit .284 with a .340 OBP, a home run, 11 doubles, four triples and 10 stolen bases in 46 games in the Gulf Coast League last summer. As with any No.1 overall pick, all eyes will be on Moniak this spring. During the offseason, he was ranked as baseball’s 17th best prospect by Baseball America and he helped himself maintain elite prospect status by bulking up. He spent three weeks in November in Clearwater at a camp designed specifically to help Phillies players develop more strength. 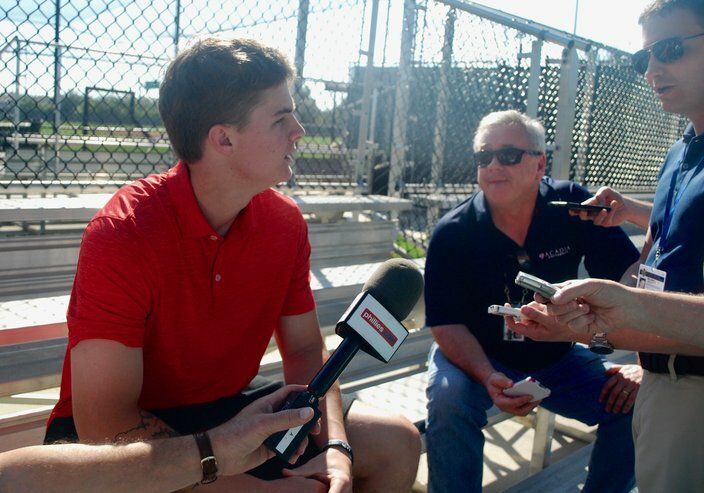 Moniak put on 20 pounds since he was drafted nine months ago; he’s up to “around 190” this spring. He’s already noticed a difference in his batting practice sessions. 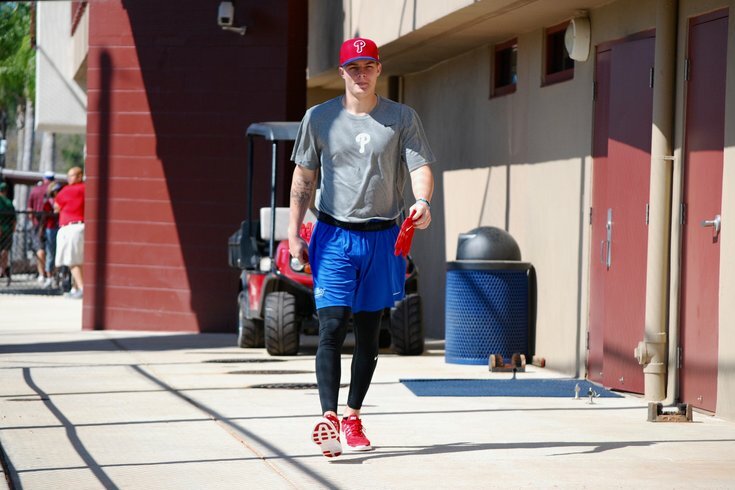 Moniak doesn’t have any specific goals for the 2017 season, his first full year as a pro, other than maintaining his health and helping his team win, wherever that might be. It may sound elementary, but it’s a smart way for a kid not trying to be overwhelmed by expectations to approach the reality of a life that’s changed drastically in less than a year. It’s worth pointing out that Moniak is only just getting started. He isn’t expected to arrive in Philadelphia this summer (or any time before 2020, probably). He isn’t on the level of a Ben Simmons–Carson Wentz type savior. That’s just not how it works in baseball. Moniak did end up spending time with one person in the exclusive club he belongs to (whether he likes it or not) in his first summer as a pro. Mark Appel, the No.1 overall pick by the Houston Astros in 2013, was rehabbing from surgery late last summer in Clearwater while Moniak was just getting adjusted to his new minor league lifestyle with the Clearwater-based GCL Phillies. In Crawford, Moniak has a template for a hopeful rapid rise through the Phillies’ system. In Appel, he has a reminder that development isn’t always linear, even for elite prospects.